The groundhog had attacked my broccoli, ate all the best parts, but left some leaves. So I left the plants in the garden. Two months later, I have broccoli! These latkes are delicious! I can’t wait to make them again for Hanukah. Tonight we had them with eggs – one of my favorite ways to eat latkes. The bread on the side is a spinach-ricotta stuffed challah, but that would be a story for another day. Steam and chop the broccoli florets. Place in large mixing bowl. Add the grated potato, diced onion, panko crumbs, eggs, pepper, salt, cayenne pepper, flour, cheese and oil. Shape into patties and fry until golden brown. North Carolina is pecan country. 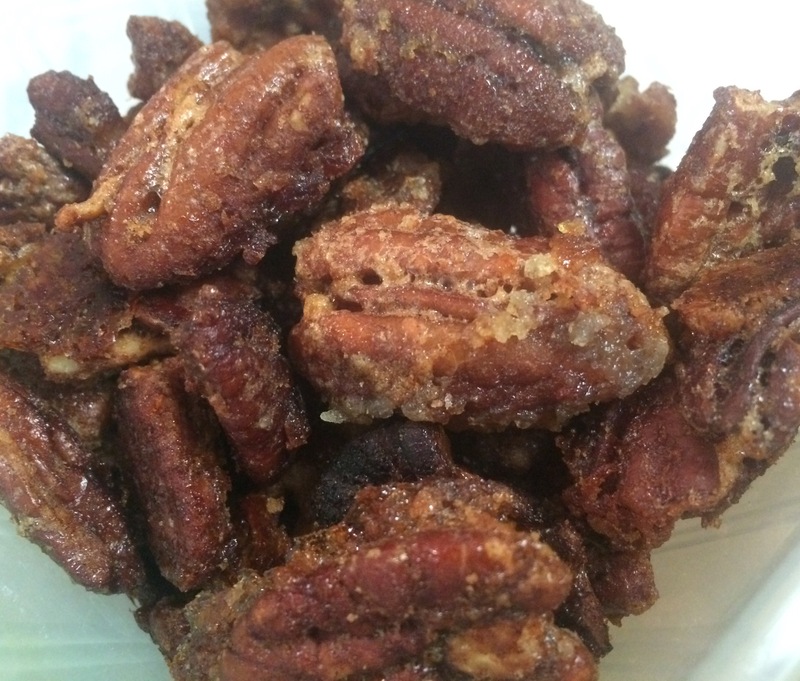 So, in honor of our vacation on the Outer Banks, I made some sugared pecans. I find pecans to be a bit bland. But they are perfect for coating with yummy goodness, especially coating that also add more crunch, such as pralines or this sweet cinnamon-sugar coating. 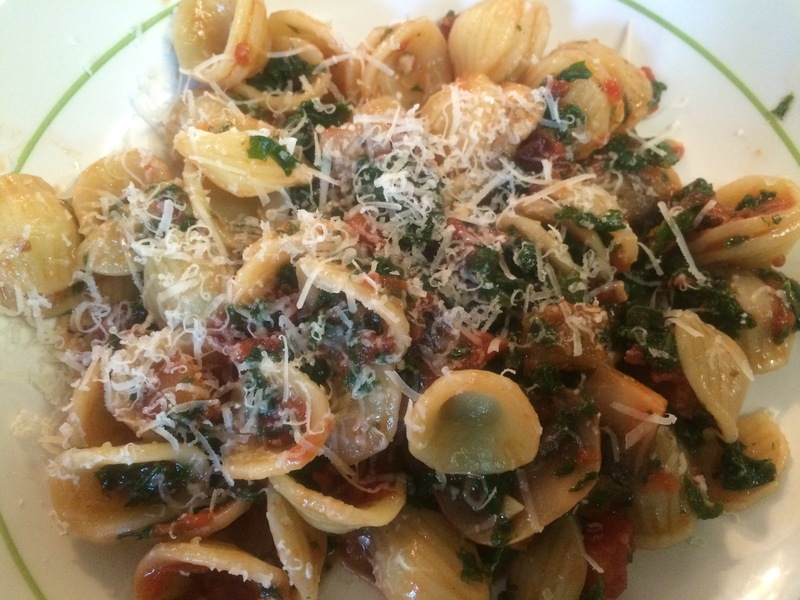 I only had about a cup of pecans, so I scaled the recipe down – it scales fairly easily. I just used 1 egg white instead of 3 and divided everything else by 4. But I have to say, I wish I had more pecans! Line a large baking sheet with sides with aluminum foil. Pour the butter onto the lined sheet. In a large bowl, mix the egg whites, sugar and cinnamon. Add the pecan halves and toss until they are fully coated. Spread the pecans onto the baking sheet. Bake for 30 minutes, stirring the pecans every 10 minutes. Cool on the baking sheet for 10 to 15 minutes before serving. Enjoy! We are vacationing on the Outer Banks this week. I am looking forward to getting some local peaches and nuts, and probably some wine as well. 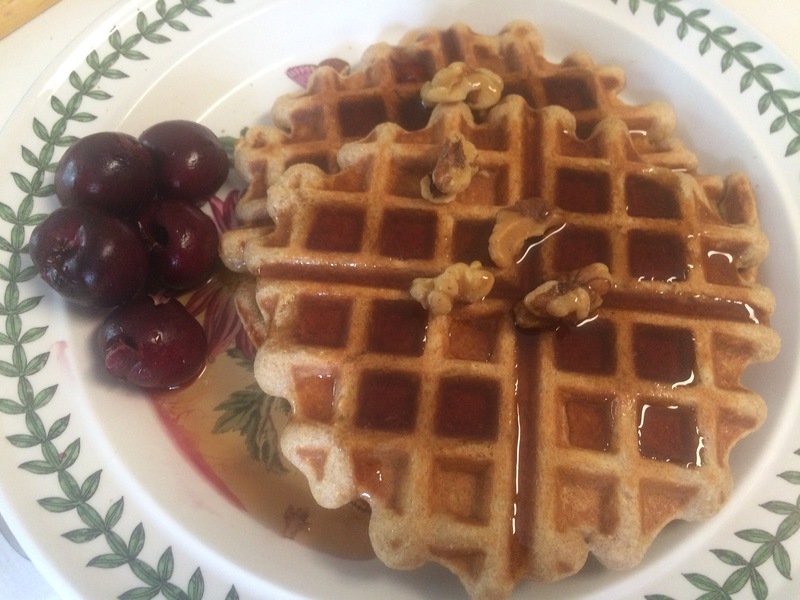 But while we are gone, I leave you with a breakfast I made before we left – perhaps my favorite waffles yet. Preheat a waffle iron to medium-high. Preheat the oven to 200 degrees F (to keep cooked waffles warm). Whisk together the flour, cornmeal, oats, wheat germ, if using, baking powder, salt and baking soda in a large bowl. Whisk together the buttermilk, oil, sugar and eggs in another bowl. Pour the buttermilk mixture into the flour mixture and gently stir until just incorporated (it’s okay if there are some lumps). Lightly brush the top and bottom of the waffle iron with oil. Fill the waffle iron about three-quarters of the way full (some waffle iron should still be showing). Close the lid gently and cook until the waffles are golden brown and crisp, 6 to 7 minutes. Keep the cooked waffles warm in the oven or covered with foil on a plate while you make the remaining waffles. Today I was able to visit a farm stand for Magee Farms. But it was not just any farm stand, I had helped the Magees obtain the permission to start a u-pick operation on this historic farmland. So, I was especially pleased to be able to buy strawberries at “my” farm stand. So, of course, I bought more strawberries than we can possibly eat. 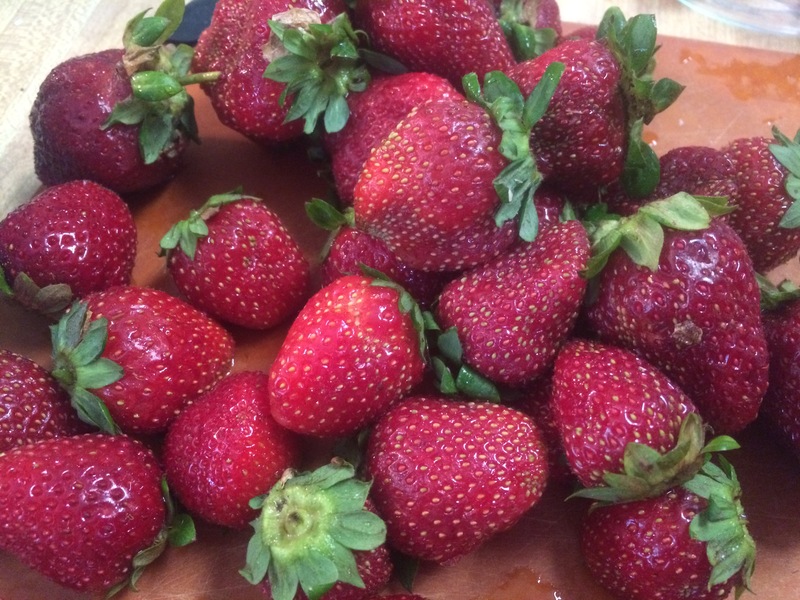 Time for another type of strawberry treat – strawberries in minted honey syrup. 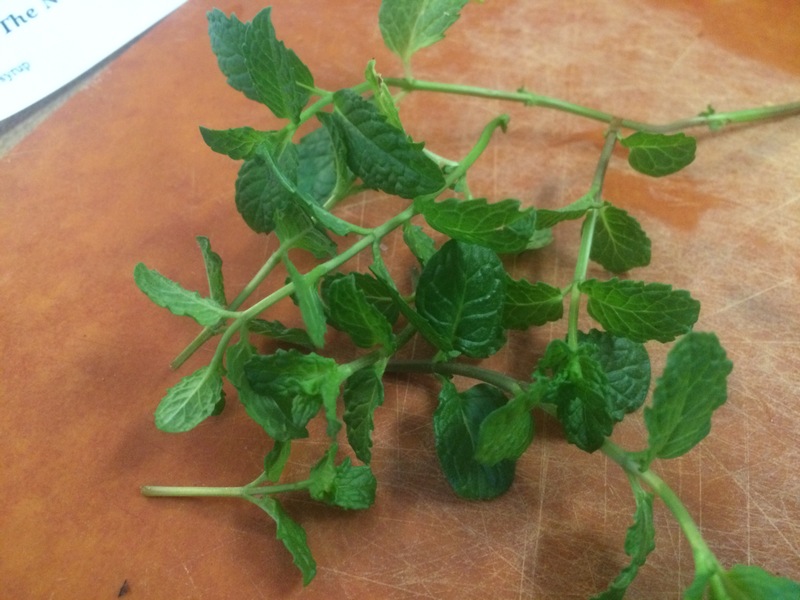 I used mint that I have grown on my windowsill, and honey from the next town over, so this is a totally local treat!! Serving suggestion – add to plan greek yogurt – yum! Bring the water to a simmer in a small saucepan over medium heat. Pour in the honey and whisk it into the water until it dissolves fully. Continue simmering over medium heat for 5 minutes. Remove the pan from heat and let the syrup cool to room temperature. Hull the strawberries, cut them in half, and place them in a bowl. 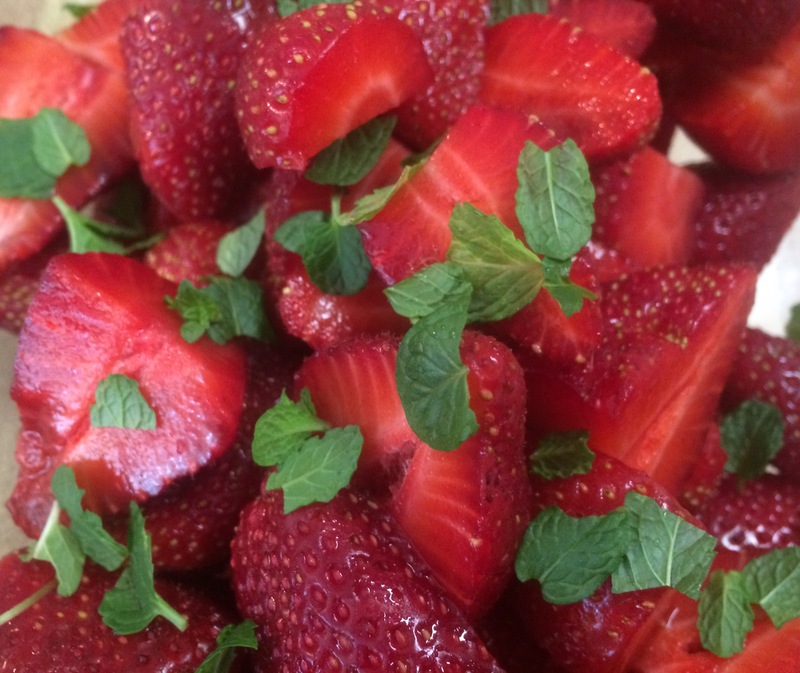 Pluck the leaves off the stems of mint, tear them and add them to the bowl with the strawberries. 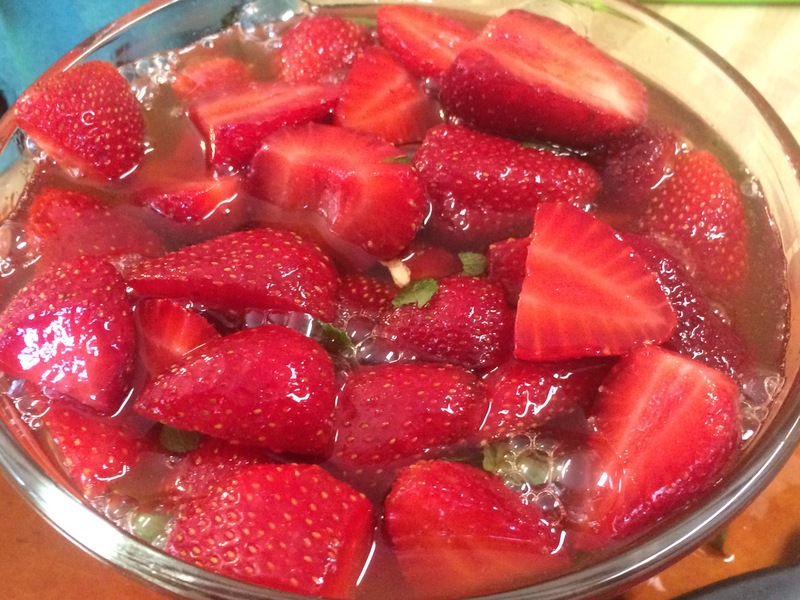 Pour the cooled honey syrup over the strawberries and mint, then cover the bowl and place it in the fridge. Allow the berries to marinate for a day, then serve them with their syrup. Enjoy!! I have not posted a sourdough recipe in a while. Not to worry, my sourdough starter is alive and thriving, although at times I am sure it feels a little neglected. Many week go by where it just gets fed and returned to the fridge. But this week it was taken out to play! Aren’t they beautiful? 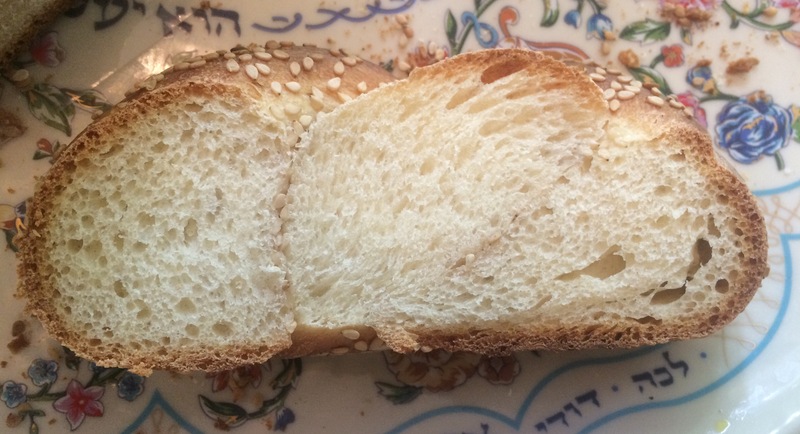 This churek is a Shabbat bread from Rhodes. We are enjoying it with butter and preserves or lemon curd – what a treat for breakfast. Knead the starter into the water until it is partially dissolved, then stir in the flour. Knead this firm dough until it is smooth. Remove 1 2/3 cups and place it in a sealed container at least its 4x its volume, to use in the final dough. Let this ferment until it has tripled in volume and has begun to deflate, 8 – 12 hours. Make the autolyze – in a large bowl, whisk together the 2 eggs, oil and water, then stir in the flour. Briefly knead until it is well combined. Cover and let rest for 20 minutes. Make the dough – Tear the sourdough starter into about 5 pieces, add it and the salt to the dough, knead them together. When the mixture is fairly well combined scrape it onto your work surface and knead until the dough is smooth, but no more than 10 minutes. If the dough is too firm, add a Tbsp of water, if it seems too wet, add a Tbsp of flour. The dough should feel soft, stick to itself easily but not to the work surface, and should be easy to knead. 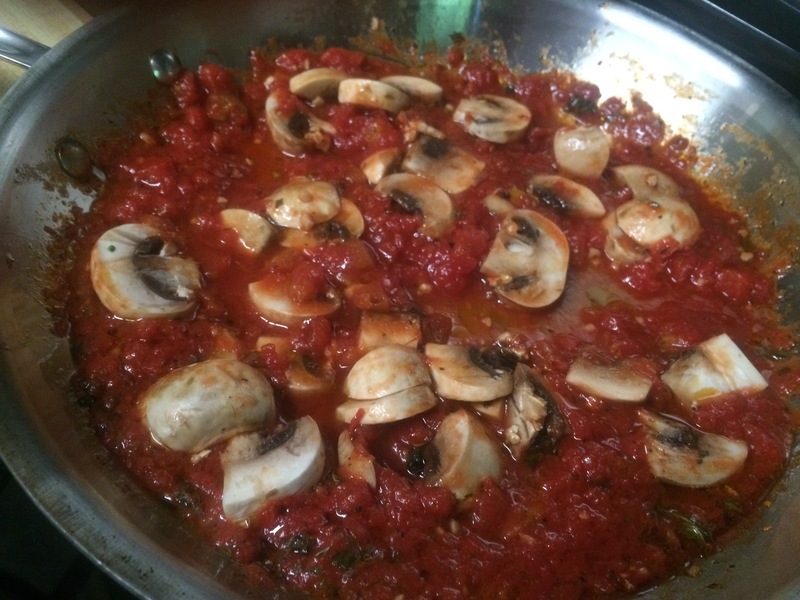 Ferment the dough – Place the dough in a warmed clean bowl and cover with plastic wrap. Let the dough ferment for 2 hours. Shape and Proof the dough – Line a large baking sheet with parchment paper. Divide the dough in half. Roll out each half into a rectangle about 1/2 inch thick, using a little flour to help prevent the dough from sticking, if necessary. Roll each sheet up into a strand about 1 1/2 inches thick and about 30 inches long. Fold the right 1/3 against the center 1/3, then wrap the left 1/3 around it, creating an elongated spiral. Pinch the end of the spiral to seat lt.
30 minutes before baking, preheat the oven to 400F. Beat the last egg with a little salt and brush on top of the loaves. Place on the center rack of the oven. Bake – Bake the loaves for 50 – 60 minutes, until very well browned. Remove from the oven and cool on a wire rack. Enjoy! The strawberries are finally ripening in my garden AND I am beating the bunnies and birds to them (for the most part). They are new plants this year, so my harvest is slow and steady, not the rush of berries I have had with more mature plants. So I am supplementing with berries from local farmers. They all have tasted fabulous! I have pecans in my pantry that I intended to use is a recipe that I never ended up making. 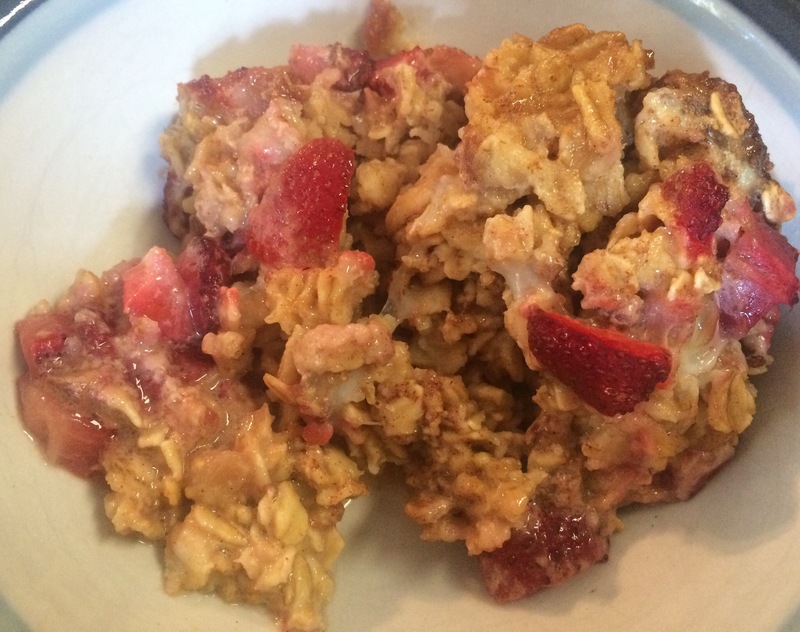 Why not combine them with the strawberries for a delicious breakfast treat. I’ll give you a close up on a portion, but it is really hard to get a picture of oatmeal that looks as appealing as it tastes. For that, I apologize. It was my husband’s birthday yesterday. 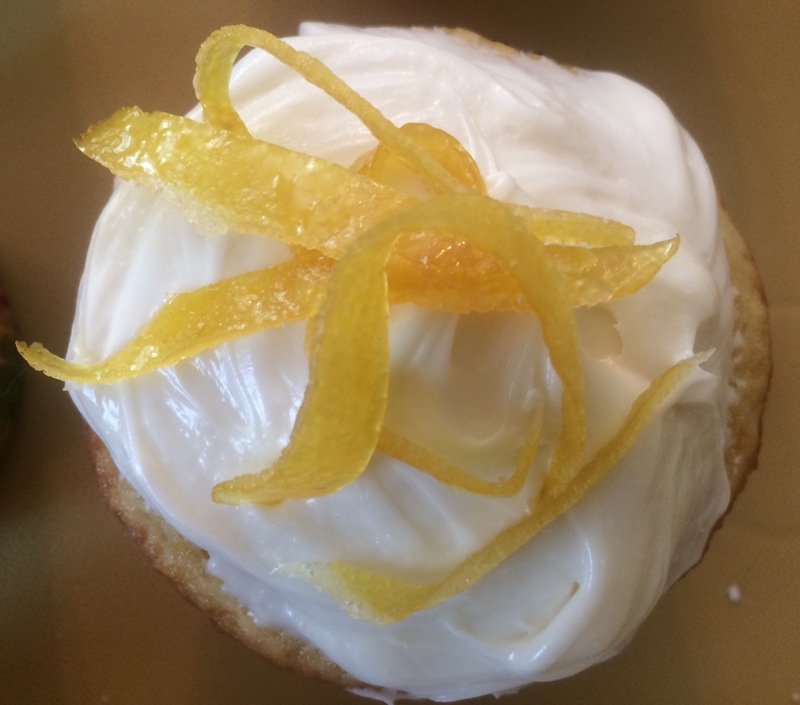 We celebrated with lemon cupcakes. Grease a baking pan (I used a round 6″ pan) and set aside. In a small skillet, heat the chopped pecans over medium heat and toast for 4-5 minutes, until fragrant, stirring often. In a medium mixing bowl, combine dry ingredients: nuts, oats, baking powder, cinnamon, and salt. In a separate bowl, combine wet ingredients: eggs, vanilla, milk, butter, honey. 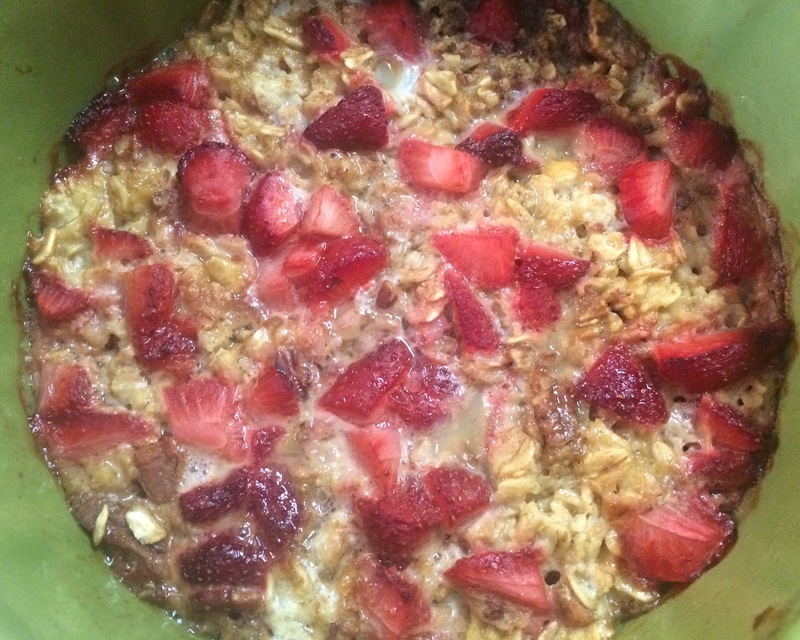 Spread 1/2 of the strawberries in the baking pan. Cover with dry oat mixture. Then pour the wet mixture evenly over the top. Pat down any dry oatmeal to ensure that the dish is thoroughly covered with the milk. Spread the remaining strawberries on top, and sprinkle with light brown sugar, if desired. Place in the oven and bake for 35-40 minutes. Remove from the oven and allow to cool 5-10 minutes for serving. 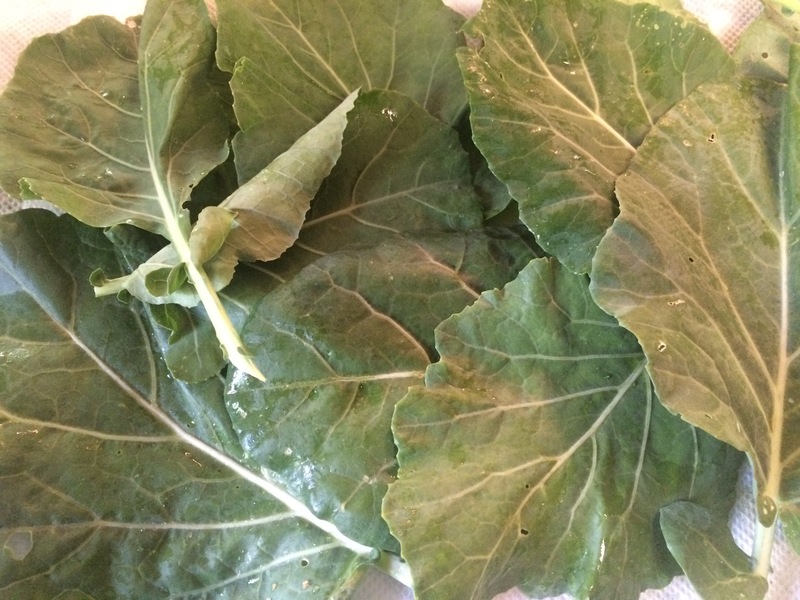 The collards in my garden have come back strong after the groundhog decimation of early spring. 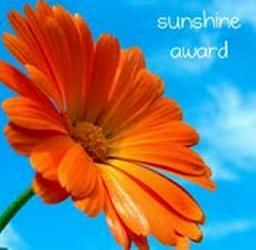 Thank you solar powered electric fence. They are finally growing bigger and healthier leaves. 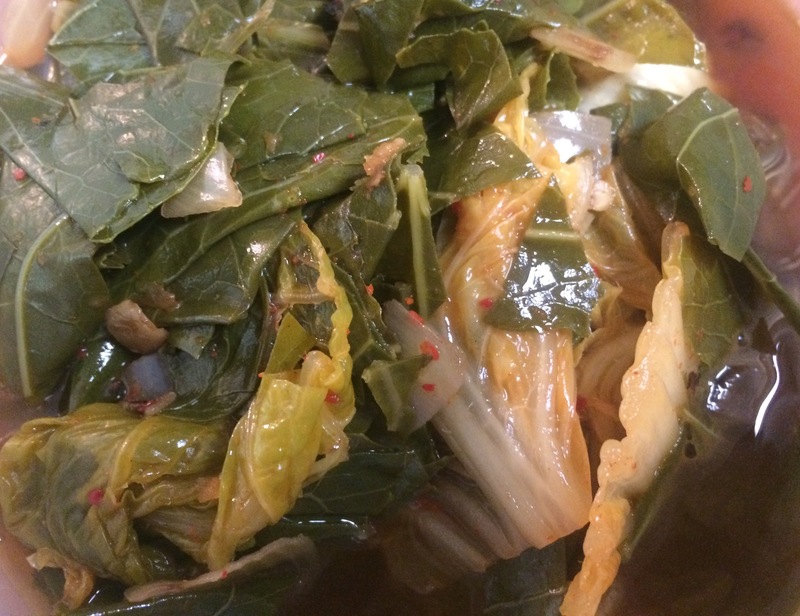 I found a recipe by Chef Ed Lee for collards and kimchi (I LOVE kimchi) but it used lard and ham – foods we do not eat. So I adapted it to a healthier version. 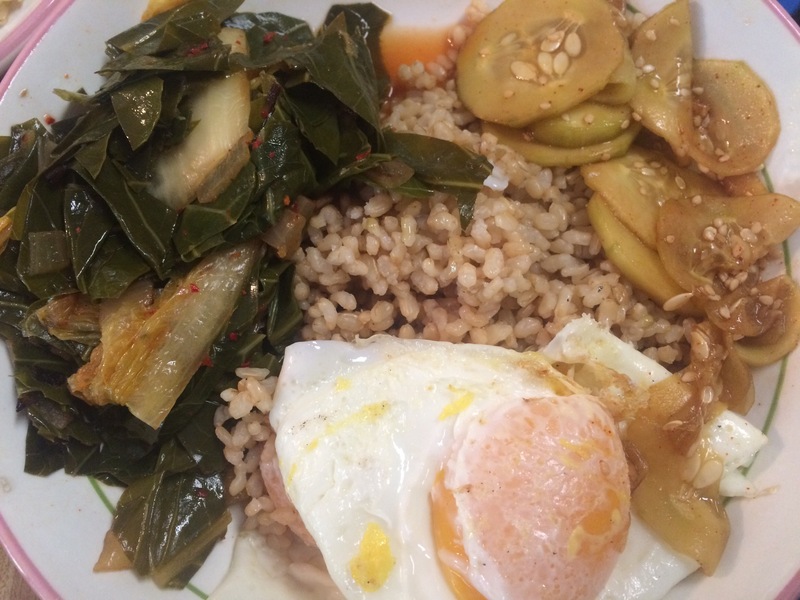 While I was making it, I also made a Korean cucumber salad and was going to make fried eggs. So I realized I basically had a deconstructed bibimbap without the rice. So, I made some brown rice and a version of bibimbap it became. In case you are wondering, we used microwavable brown rice which I keep in the pantry. If I regular rice, it would have taken too long; it really was a last minute decision. By the way, the cucumber salad was fantastic. I will post a version once my cucumbers come in. Heat the butter in a medium pot over high heat. 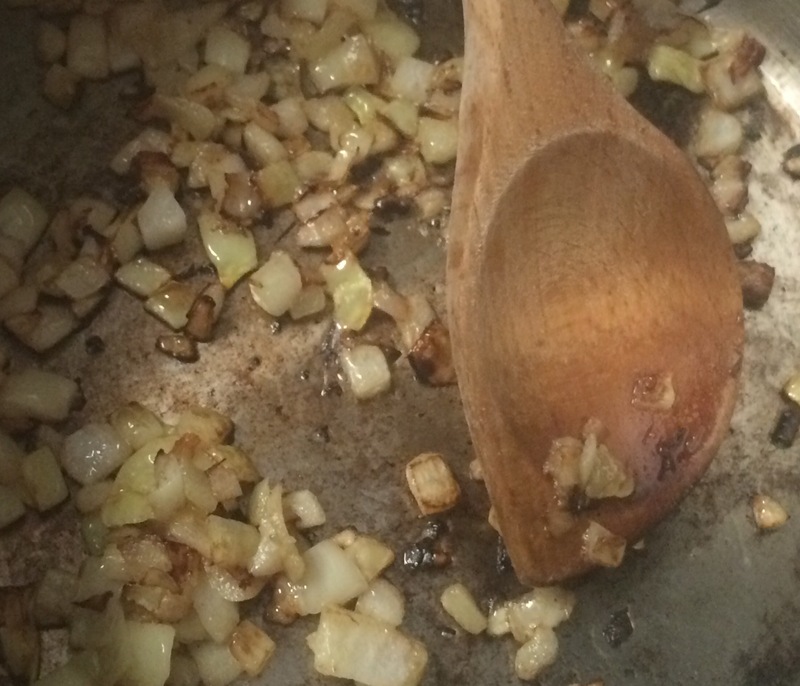 Once it foams, add the onions and saute for 5 – 7 minutes, until they are nicely colored. Add the collards, chicken stock and soy sauce. 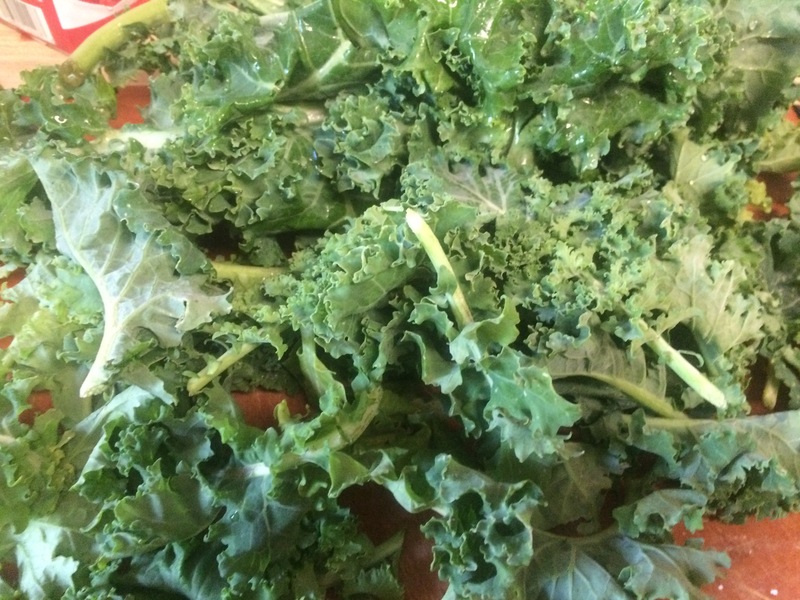 Cover and cook over medium heat for 15 – 30 minutes (fresh collards from the garden cook on the shorter end). 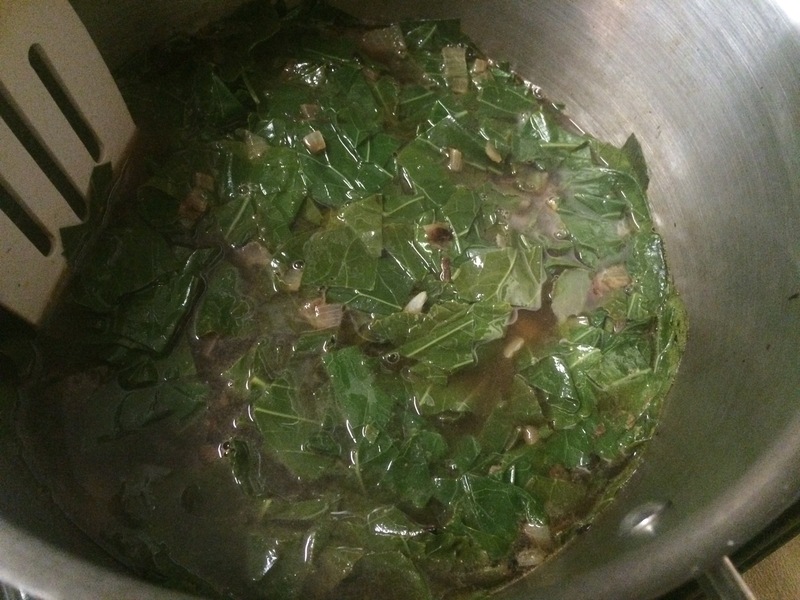 The collards should be tender but still have a little chew to them. Add the vinegar and cook for 1 minute. Add the kimchi, mix and serve immediately. juices and all. Enjoy! In honor of my daughter starting her doctorate of physical therapy program at Boston University, instead of challah, I made Scali Bread this week. Scali bread (1 loaf is a Scala, rhymes with challah) is an Italian bread popular in the Boston area. This was one of the nicest doughs I have ever worked with and the texture of the bread itself is light and airy with a crisp crust. 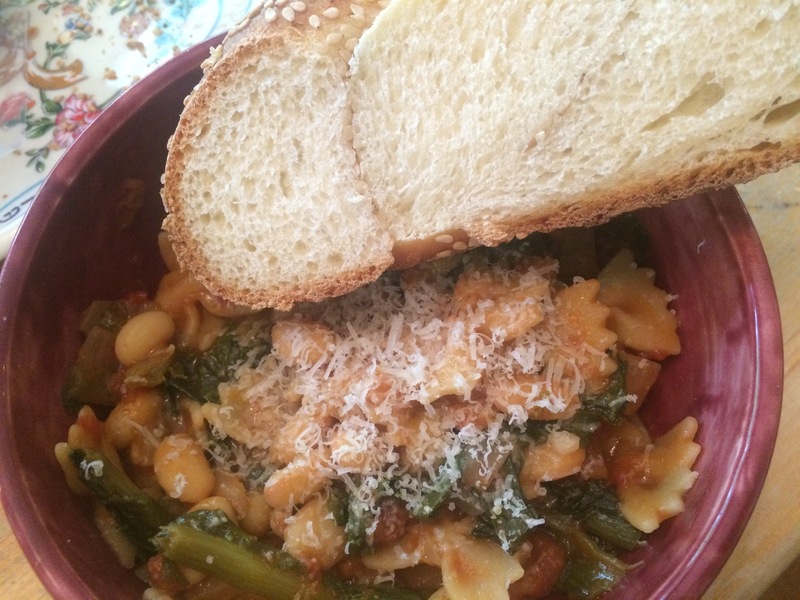 We enjoyed the Scali Bread with some home-made Pasta Fagiole, a perfect combination! Combine the starter with the remaining dough ingredients, and mix and knead — by hand, mixer, or bread machine set on the dough cycle — to make a soft, smooth dough. Place the dough in a lightly greased bowl; cover, and let it rise for about 90 minutes, till it’s just about doubled in bulk. Gently deflate the dough, and divide it into three equal pieces. Shape each piece into a rough log, and let the logs rest, uncovered, for about 10 minutes. This gives the gluten in the dough a chance to relax, which in turn will make the logs easier to roll. Working on a lightly greased surface, roll each log into a rope about 24″ long. Brush each rope with the egg white/water, and sprinkle heavily with the sesame seeds, rolling the ropes gently in the seeds to pick up as many as possible. Grab one end of each rope, and squeeze the ends together firmly. Braid the ropes, tucking the ends under to make a neat braided loaf. Place the loaf on a large, parchment-lined baking sheet. Cover the loaf with lplastic wrap, and allow to rise till very puffy, about 90 minutes. Towards the end of the rising time, preheat the oven to 425°F. Bake the loaf for about 25 to 35 minutes, till it’s a deep golden brown. Remove from the oven, and cool on a rack. Enjoy! 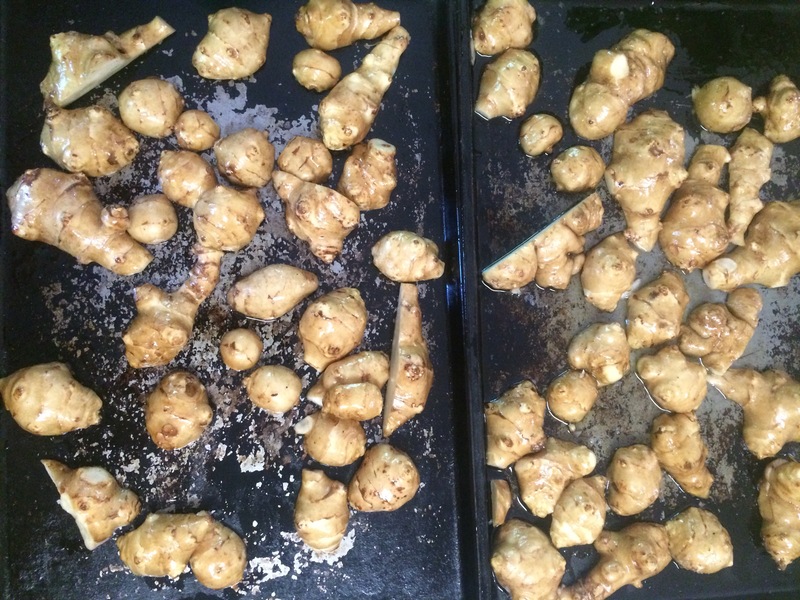 One last Jerusalem artichoke recipe until next winter’s harvest. It always amazes me how well these root vegetables last when they are cleaned and stored in a refrigerator. 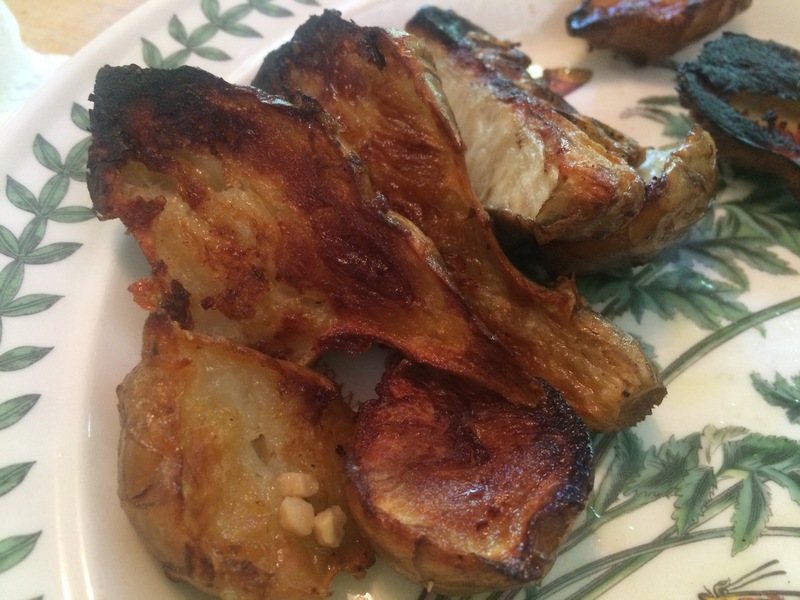 I have roasted the Jerusalem artichokes several ways, but the approach here was a new one that I am very pleased with. 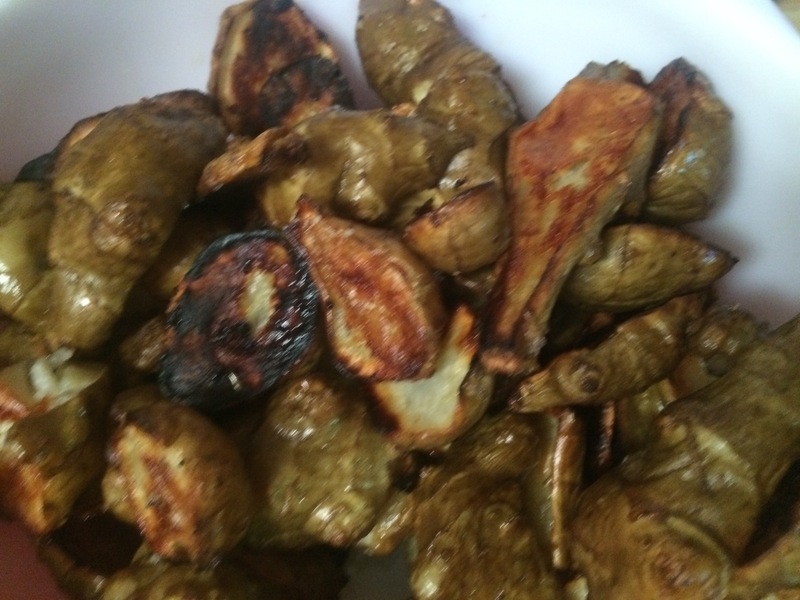 Before roasting, the Jerusalem artichokes were soaked in water with lemon juice for 45 minutes to an hour. After halving and a quick toss with olive oil, salt and pepper, they get roasted for half an hour or so. You end up with beautifully caramelized treats. 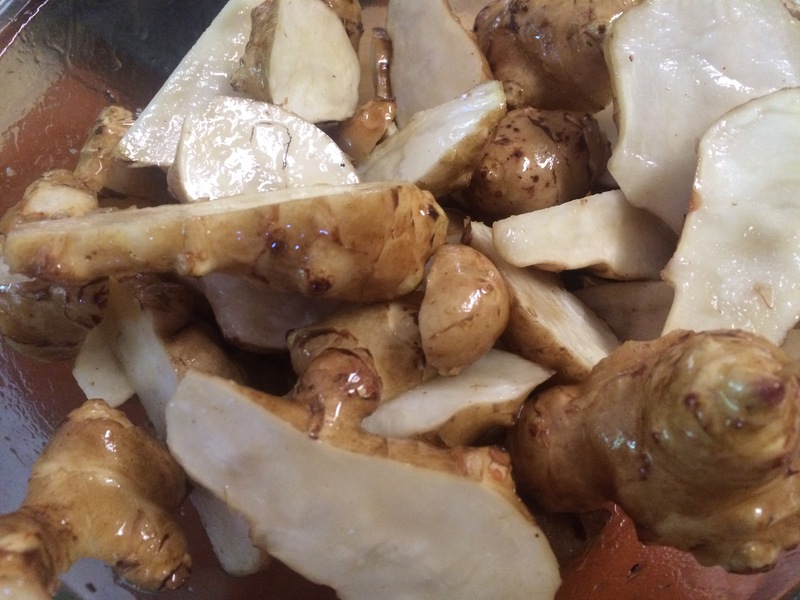 Place the Jerusalem artichokes in a large bowl or pot and cover with cold water. Add the lemon juice. Let soak for 45 minutes – 1 hour. 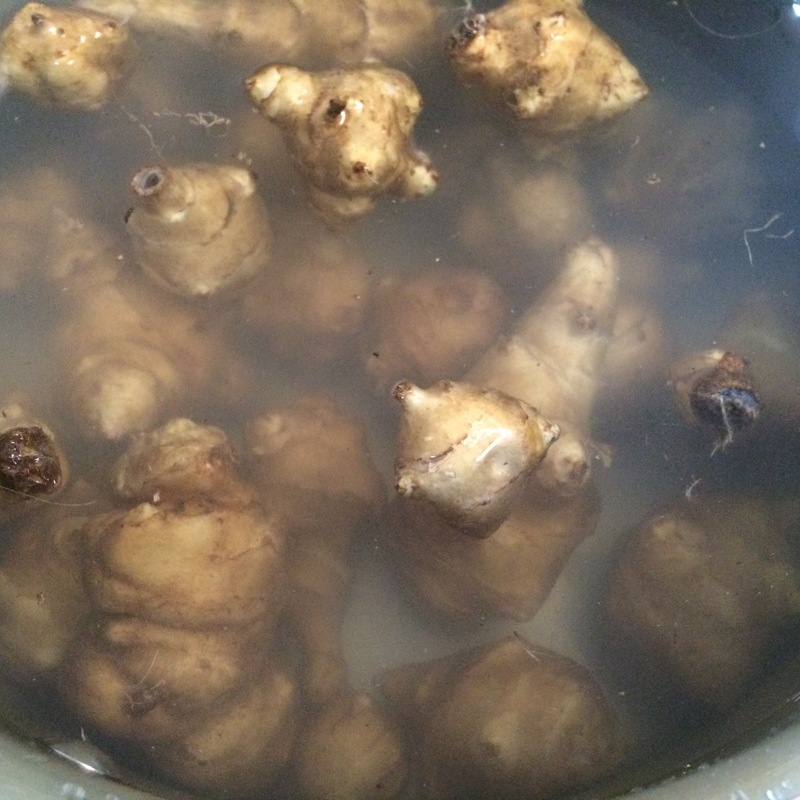 Remove the Jerusalem artichokes from the water. Trim any rough spots and cut each in half lengthwise. 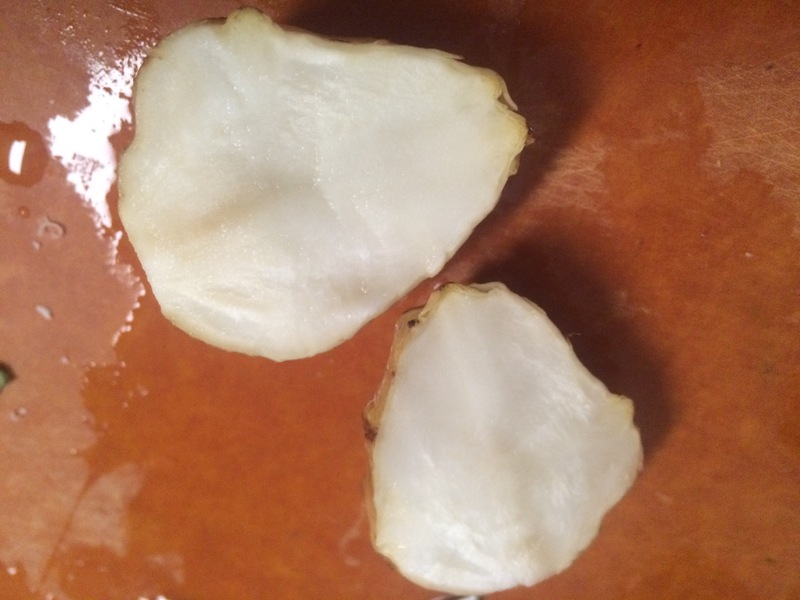 Place the Jerusalem artichoke halves in a large bowl and toss with the oil, salt and pepper to coat well. Pour the contents of the bowl onto baking sheets and turn the halves cut-side down (do not crowd them). Place int he oven and roast for 45 – 50 minutes. Let cool for a couple of minutes, remove with a spatula and serve. Enjoy! 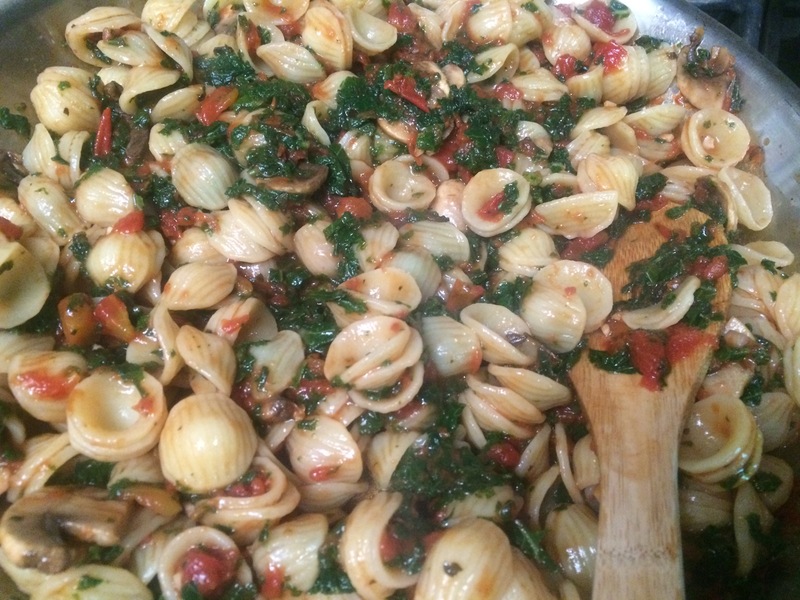 Serves 3 – 4 as a side dish.